Iain Gray MSP has visited Macmerry-based steel and aluminium structure design and fabrication company, Had Fab, to help mark this year’s Scottish Apprenticeship Week (4-8 March). The theme for apprenticeship week this year is ‘Skills for the Future’, recognising the importance of investing in the workforce, and that was very much at the heart of Had Fab’s enthusiastic support for apprenticeships. Working with Skills Development Scotland, which organises the week, Mr Gray visited the firm to hear more about why apprenticeships are so important to its development and to meet some of the seven apprentices currently working at Had Fab. 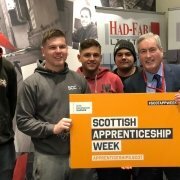 “Scottish Apprenticeship Week is an important opportunity to showcase the benefits apprenticeships bring to individuals, businesses and the economy. I always support and help promote the week and was very pleased to visit Had Fab and meet some of their apprentices this year. “As well as meeting five of the firm’s current apprentices, who all had positive things to say about their own apprenticeships, I also met a couple of former apprentices who have moved on to more senior positions within the business. “Work-based learning is providing the skills needed for a successful Scotland. 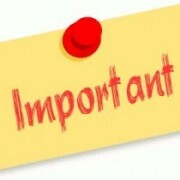 The theme for this year is ‘Skills for the Future’ which recognises the importance of investing in our workforce. Please note that Iain will not be at his regular advice surgeries in Haddington, North Berwick and Dunbar on the afternoon of Friday 8th March as he will be attending the Scottish Labour Party Conference. Two of his staff members will attend these locations to assist constituents, however if you prefer you can drop Iain an email at iain.gray.msp@parliament.scot or call his constituency office on 01620 822711. As part of the celebrations marking 300 years of Belhaven Brewery, Iain Gray MSP has hosted a reception at the Scottish Parliament. Staff from Belhaven set up a bar in the Parliament’s Garden Lobby to enable MSPs and other guests, including the CEO of Greene King, the brewery’s owners, to sample some of its popular beers. The reception is part of a programme of events and activities throughout the year to celebrate the anniversary, which will include the opening of a £500,000 visitor centre at the brewery. “I was very pleased to welcome numerous guests, including Greene King’s CEO Rooney Anand, to this celebratory reception in the Scottish Parliament to mark 300 years of Belhaven Brewery. A group of P7 pupils from Longniddry Primary School have been welcomed to the Scottish Parliament by Iain Gray MSP. The group arranged their trip to Holyrood through Parliament’s Education Outreach service, which arranges for thousands of pupils from across Scotland to visit each year. Mr Gray met with the pupils during the visit, spoke to them about his role representing the East Lothian constituency in Parliament and answered some of their questions about the way Parliament works. “It’s always a great pleasure to welcome groups of pupils from East Lothian to Holyrood. These visits have always been regular events, but they seem to have become even more common in recent times, with local schools here on almost weekly basis. 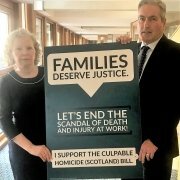 Iain Gray MSP has backed plans to amend the law of culpable homicide in Scotland and tackle fatal workplace incidents. Mr Gray has shown his support for the Culpable Homicide (Scotland) Bill that will create new legal avenues for the families of victims killed by recklessness or gross negligence by their employer. Over the past five years an average of 17 people have died each year in industrial incidents in Scotland, a higher per head of population rate than the UK average. Despite these deaths there has not been a single prosecution under existing legislation in the last decade. Scotland has experienced a number of high-profile incidents where families failed to receive the justice they deserved. These include the Transco gas explosion in Larkhall that killed a family of four in 1999, the sinking of the Flying Phantom tug in 2007 that killed three members of the crew, and the 2009 Super Puma helicopter crash in the North Sea killing sixteen people. The bill, lodged by Claire Baker MSP, currently has the support of Scottish Labour leader, Richard Leonard, Scottish Hazards, Thompson’s Solicitors and campaigner Louise Taggart. Louise’s brother died in 2005 as the result of a preventable electrocution at his work. “Far too many people in Scotland each year do not return home to their loved ones after going to work. “It is simply unacceptable, in the 21st century, to have workers dying as a result of negligence or recklessness by their employers. “Workers deserve a safe working environment, and families deserve justice if the unthinkable happens. 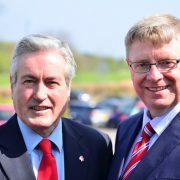 “I am delighted to have the support of Iain Gray MSP. “Many of the deaths that occur in workplaces are avoidable if health and safety protocols were fully adhered too and risks minimalised. However, too many organisations are still willing to cut corners and put workers lives at risk. We need to ensure that those that do are held accountable. 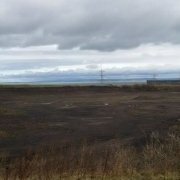 “This decision should never have been taken away from the local community. I think local people will be angry that a decision has been made by an SNP Government Minister that rides roughshod over local interests. 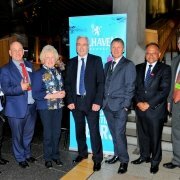 Local MSP Iain Gray has given his support to the work of a global charity dedicated to the conservation and protection of whales and dolphins. 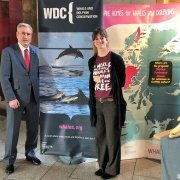 Representatives of Whale and Dolphin Conservation (WDC) were at the Scottish Parliament to tell MSPs about their work, which includes various activity in Scotland through its Shorewatch Programme. The charity is also highlighting issues such as the harm that plastic in the marine environment is causing to whales and dolphins, and the entanglement threat fishing gear can pose to whales. “Scotland’s coastline is one of the best places for land-based whale and dolphin watching in Europe. This gives us wonderful opportunities to see these majestic creatures but also puts a responsibility on us to help protect and conserve whales and dolphins in Scottish waters. “Whale and Dolphin Conservation undertakes outstanding work across the globe to raise awareness around the protection of cetaceans, and I was pleased to learn more about the charity’s activity at Holyrood. “It’s clear that there is much we can do here in Scotland. One crucial issue the charity raised is the harm caused by plastics in our marine environment. Of course, this is a wider problem and one which local environmental charity, Fidra, has been at the forefront of helping to tackle with its great nurdle hunt initiative. Iain Gray MSP and Martin Whitfield MP have vowed to keep up the pressure on ScotRail and the Transport Secretary to deliver the modern, reliable rail service commuters in East Lothian need. The renewed commitment to campaigning for rail change follows another disappointing response from ScotRail to the parliamentarians’ letter last month challenging ScotRail’s chief to meet promises made by the company on the county’s rail services. ScotRail’s reply reiterates the same excuses the company has used before, including the late arrival of new and refurbished trains and industrial action, and outlines the measures it is taking to improve local services. It also offers another apology for the inconvenience caused to constituents. “East Lothian rail users are rightly fed up with ScotRail’s litany of excuses and hollow apologies for their ongoing service failures. “Once again, ScotRail’s reply to our service challenge says all the right things about delivering more staff and investing in new and upgraded trains to improve performance. The problem is that we have heard it all before but things never seem to get better. 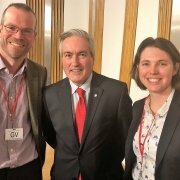 Two prominent local businesspeople have met with Iain Gray MSP at a Holyrood reception organised through a prestigious Scotland-wide rural leaders programme. Helen Gray, from Smeaton Nursery Gardens and Tearoom at East Linton, and Graham Miller, of Prora Farm near Drem, visited the Scottish Parliament as part of their participation in this year’s Scottish Enterprise Rural Leadership programme. The annual leadership programme for rural business owners and managers offers participants 13 days of activities, including leadership coaching workshops, one-to-one business focus sessions, a business strategy workshop and team working on rural innovation projects. The programme also includes visits to Holyrood, as well as to the UK and European Parliaments. “Given the rural nature of the East Lothian constituency, the Scottish Enterprise rural leadership programme is particularly valuable for business owners and managers. I know that several local people have participated and benefited from the programme over the years. “The programme is an intensive opportunity for rural leaders to develop their skills and explore ways of growing their business, as well as offering the chance to network with colleagues from across Scotland. 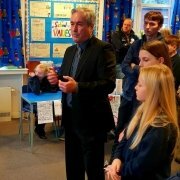 Iain Gray MSP has visited Aberlady Primary School to participate in a mock election organised by P7 pupils. Mr Gray, who had welcomed the pupils to Holyrood last month, listened to the pupils’ election speeches and pledges before they cast their votes, with the Aberlady Eco Party winning. “It was a privilege to help with the P7’s mock election, when all five “parties” really did themselves, and Aberlady Primary proud. I met the class a few weeks ago and they quizzed me on many aspects of politics and being a politician. Their policies, election leaflets and speeches clearly showed they had been listening hard.